"My Grandfather, W.H. 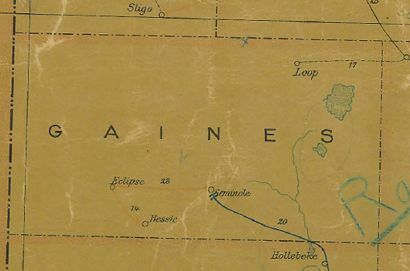 Brennand had a general Store in Seminole in 1909. This is a photo of main street Seminole at that time." Named after local Indian watering holes. County named after signer of the Texas Declaration of Independence James Gaines. 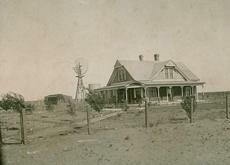 Seminole was made the County Seat of Gaines County when it was organized in 1905. 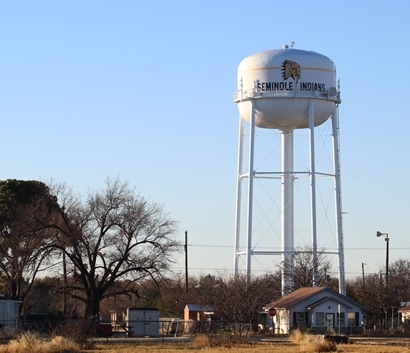 However Seagraves was the county's most populated town until 1950. The first bank was opened in 1906. Bank robbers didn't find out about it until 1912. As soon as they did they robbed it. In 1914 the population was about 300 people. For five years Seminole enjoyed a rail connection to Midland. This proved unprofitable in 1923 and the railroad (The Midland and Northwestern) suspended operations. 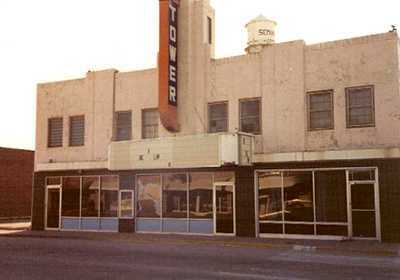 The same year, Seminole had their worst fire, destroying a good portion of downtown. Several of our sources point out the size of the Seminole School District. The Handbook of Texas says that it served 370 students over an area of 753 square miles. The Texas State Travel Guide says that it's 1,149 square miles, but has no figures on the number of students. The Gaines County Museum is located at 700 Hobbs Highway which is the same as US 180. Hours: Monday through Friday 8 to 5 with 12 to 1 reserved for lunch. Main street Seminole. "The Victorian House near the center of the picture was the Brennand Home." "This is a photo of my Aunt, Annie Lou Brennand in a car with the Ramsey Family. 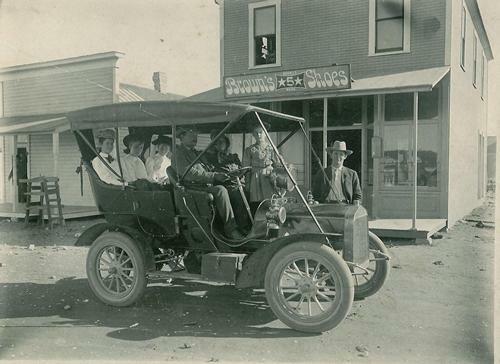 Taken in front of the Stark Store about 1910"
"My Grandfather, W. H. Brennand who had the store." Founded and designated county seat in 1905, same year county was organized. Took name from Seminole wells, Indian watering places to south and west. 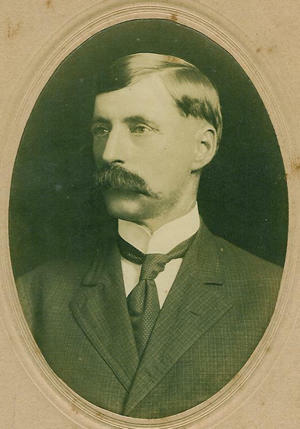 First store and post office were established in 1905 by W. B. Austin of nearby Caput. The courthouse was built in 1906. Seminole grew slowly, being chiefly important as a trading center. Arrival of the Midland and Northwestern Railroad (1918) and development of highways and oil resources all helped seed the town's later expansion. 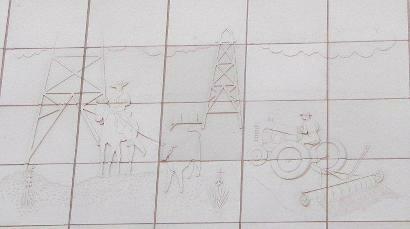 Today it is a business center for farming and petroleum industry. Subject: Seminole, Texas 1911: "...drovs of antilops and perriary chickens and heaps of wolves and perriary dogs." I live in Mayfield, Kentucky, but was raised in Northwest Tennessee not too far from Reelfoot Lake. Recently I had to put my Dad in a nursing home and I have been going through his possessions and I found two letters that were written to my Great Grandmother, Hallie Carpenter Posey, in 1910 and 1911 from a friend in Seminole, Texas. Evidently the friend had once lived in the area and had moved to Seminole. However, my Great Grandmother was from Scottsville, Ky and it could have been that they were friends there. My Great Grandmother's folks got burned out in the Scottsville area during the Civil War and I have records showing her being in Northwest Tennessee around 1871. She was born in 1850 and passed away at the age of 99 in 1949 there in Northwest Tennessee. Her friend, Mrs. Lettie Abshure wrote some very long letters to her during this time and described Seminole in detail. Please find [the following] excerpts from the letters and let me know if anyone may know of her. The excerpts are copied exactly as written and provide some insight into the language, spelling and history of the times. If I can be of further service, do not hesitate to contact me. - Kenneth M. Smith, Mayfield, Kentucky, November 15, 2006. See excerpts from the letters.